Daniel Gray was recognized as the City of Eaton’s Employee of the Year during the city council meeting held Monday, March 18. Pictured, he is honored by Mayor Gary Wagner. EATON — Daniel Gray was honored as the City of Eaton’s Employee of the Year during the city council meeting held Monday, March 18. Gray began working for the City of Eaton Public Maintenance Division three years ago as a service worker. He now works as the crew leader. He supervises and leads the crew and manages different city projects, ensuring they get completed successfully. According to Gray, he was nominated by Assistant City Manager and Director of Public Safety Joe Ferriell for his communication and collaboration with all divisions. “I think it is important because it brings everyone together as one team, not as separate entities,” he said. “I’m proud to work for the City of Eaton and we have a great Public Maintenance crew of great guys. Everyone gets along and is very motivated. They are a very big part of the city. 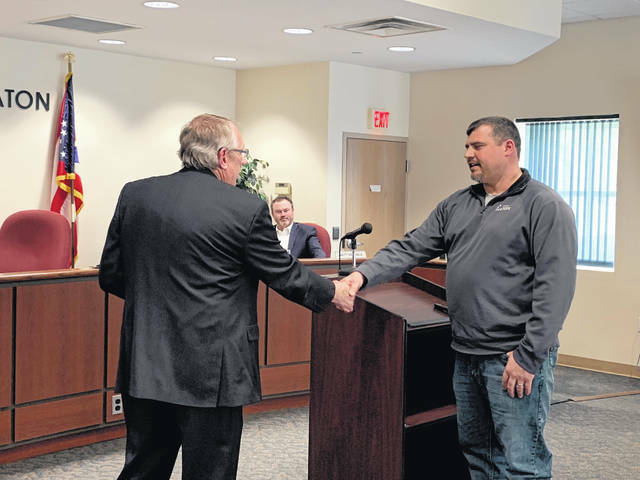 https://www.registerherald.com/wp-content/uploads/sites/41/2019/03/web1_IMG_1051.jpgDaniel Gray was recognized as the City of Eaton’s Employee of the Year during the city council meeting held Monday, March 18. Pictured, he is honored by Mayor Gary Wagner.